The Custom of the Army is a Lord John novella, set in 1759, involving an electric eel party, an ill-fated duel, and the Battle of Quebec. It was originally published in the anthology WARRIORS, edited by George R.R. Martin and Gardner Dozois. (Later this anthology was published in three paperback volumes; “The Custom of the Army” is in WARRIORS 3. Evidently, people didn’t care for that approach, though; I see a new single paperback is being released in early 2013.) 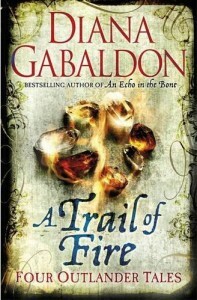 It is also available in some areas in ebook format, and it is included in A TRAIL OF FIRE, an anthology of four Outlander tales. More info. on A TRAIL OF FIRE. As a stand-alone e-book (in the U.S. and Canada, but not in the U.K. and Commonwealth) for $1.99 through Amazon.com. Click to purchase the e-book. As part of the original anthology (hardcover, paperback, and Kindle edition) at Amazon, with prices ranging from $18.47 to $11.55 (you can likely find it used for less, as well). Use the pull-down menus on the left side of this web page. 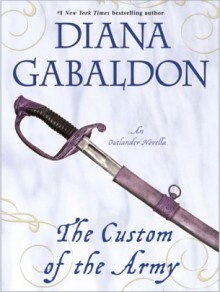 Or (in the UK/Commonwealth, but not (yet) the US/Canada) as part of A TRAIL OF FIRE a book-length collection of “Four Outlander Tales,” as they put it. Now, you can order A TRAIL OF FIRE from Amazon.co.uk (or the Book Depository), a new anthology of four Outlander tales, even if you live in the U.S. or Canada; but you can’t get the Kindle version of it unless you live in the U.K. or Commonwealth territory. Click here for my blog of September 4, 2012, which clarifies availability of my short fiction. 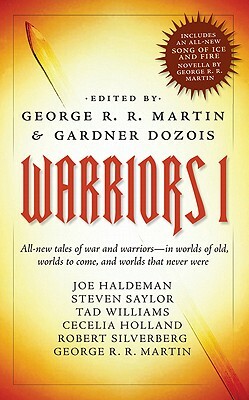 WARRIORS (aka WARRIORS 1) is the first volume of a cool, multi-genre, multi-author anthology with stories on the theme of—well, warriors. My contribution to this work is Lord John and the Custom of the Army, a novella featuring Lord John Grey from the Outlander series. WARRIORS is edited by George R.R. Martin and Gardner Dozois. 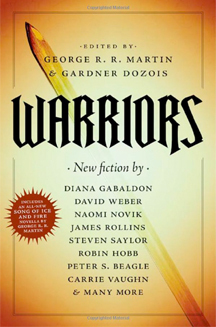 Other authors contributing to this anthology include Peter S. Beagle, Joe Haldeman, Robin Hobb, Cecilia Holland, Robert Silverberg, Carrie Vaughn, Tad Williams, editors George R.R. Martin and Gardner Dozois, and many others. It was first released in hardback in March, 2011. Thus begins a story that takes us from a duel in London to the Plains of Abraham.